This collaborative performance was developed from everyday sounds and objects, lo-fi technology and computer, and has its roots in Arte Povera, in a special homage to Michelangelo Pistoletto. Besides the microphones and computer, the use of motorized or electronic tools, as well as found objects (leaves, twigs, paper, marbles, vegetables, bicycle, screws, etc. 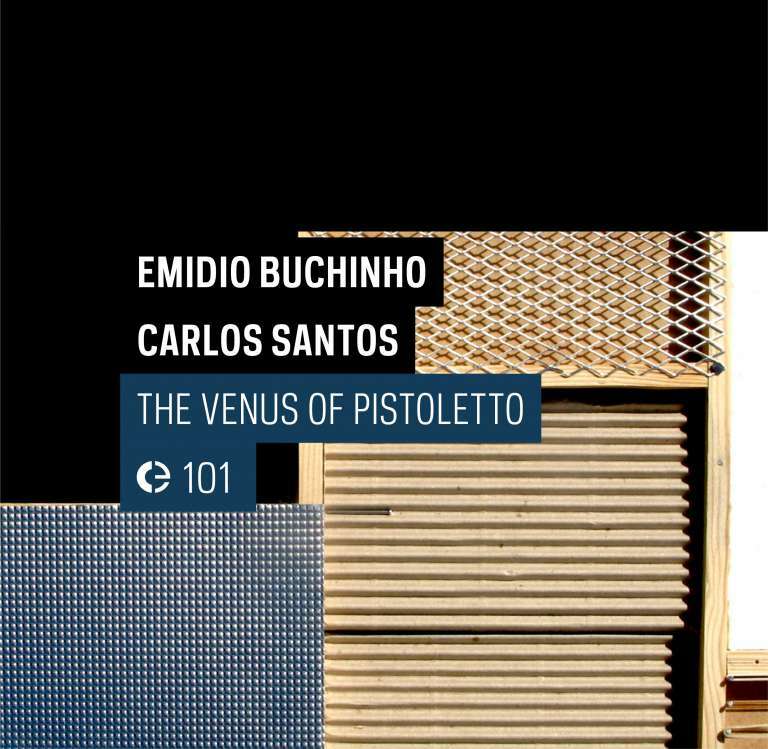 ), is essential for creating the sounds that make up The Venus of Pistoletto, a mixture of concert, performance and installation, where small mechanisms embody an almost “factory-like” activity, enveloping the audience in sound. The Venus of Pistoletto was created between 2006 and 2011, and was commissioned by the Granular Association. It was premiered at “Der Gelbe Klang” cycle in 2006, curated by Granular at the Museu do Chiado, Lisbon. It was also presented at the “CreativeSources Fest#2” at Galeria Monumental, Lisbon, in 2007 and at Espaço Avenida, Lisbon, in 2008. This recording was made at the public performance of April 13, 2011, at Culturgest, Lisbon, in the “27 Senses” cycle, also organized by Granular. Emídio Buchinho is a Sound Designer, Operator and Editor / Musician and Composer / Teacher / Researcher. Self-taught guitarist at the age of 15. Emídio attended Classical Guitar and Music courses at the Academia de Música e Belas-Artes Luísa Todi and at the Conservatoire Municipal de Château-Thierry. In 1982 he formed an experimental music project with Vitor Joaquim. He graduated in Sound and Film Studies at the Escola Superior de Teatro e Cinema. Emídio took part in various workshops on Structures, Forms and New Technologies in Improvised Music, supervised by Carlos “Zíngaro”, Peter Kowald and Richard Teitelbaum; on Music and Sound Design for Film, Video and Games directed by Bruce Pennycook; on Loudspeakers Orchestra and Sound Spacialization, directed by Miguel Azguime. He was the assistant to the musician and composer Carlos “Zíngaro” between 1997 and 2000. He participated in concerts and intermedia performances with the likes of Carlos “Zíngaro”, Günter Müller, Carlos Santos, Otomo Yoshihide, Vitor Joaquim, Rudiger Carl, António Chaparreiro, Ulrich Mitzlaff, Pedro Alçada, Matt Wand, Nuno Rebelo, Mike Beck, Miguel Cabral, Erik M, Ricardo Guerreiro, Phill Niblock, João Silva, Pedro Lopes, José Oliveira, Adriana Sá, Ernesto Rodrigues, Ben Rubin, João Pedro Viegas, Ludger Lamers, Isabelle Schad, Olga Roriz, Margarida Bettencourt and João Natividade, among others. He works on a regular basis in the areas of musical composition, performance and production, sound engineering, editing and design for films, documentaries, art installations, stage plays, dance, performance art, intermedia and television advertising in Portugal, Spain, France, Germany and the UK. He performed at festivals and regular places for experimental art such as Mergulho no Futuro (Lisbon), Atlantic Waves (London/Glasgow), Lem (Barcelona), Madeira DIG (Madeira), Instants Chavirés (Paris), Danças na Cidade (Lisbon), Eye For An Ear (Berlin), Musonturm (Frankfurt), Metasonic (Lisbon), Museo Vostell (Malpartida), EME (Setúbal), ZDB, CCB, Culturgest, Gulbenkian Foundation, Goethe Institute, Rivoli, etc. He is a professor and specialized trainer for Sound and Audiovisual Media, Electronic and Experimental Music and a recognized expert on sound for Audiovisual and Multimedia. He's a PhD Student in Science and Art Technology - Computer Music, at UCP - Universidade Católica do Porto, with the advising of the composer Dr. António de Sousa Dias. He's a researcher at CITAR - Research Center of Science and Technology in Art, Porto and a co-founder and co-director of the Granular Association. Carlos Santos is a musician, sound artist, and graphic designer. He studied painting with António Sena (Ar.Co, 1988 -1992) and works as graphic designer in corporate identity, packaging and web at SpoonDesign.com.pt. He started sound/music activities in 1989 when formed the Vitriol project with Paulo Raposo, a laboratory for experimental sound actions, in a first stage with studio work followed in 1994 by live output, mainly live electronics, concrete music with a improvised or score oriented approach. Uses the laptop with software written in Max/MSP, small resonant objects, microphones and piezo elements to produce a music that deals with space and its sound characteristics. Interests in “soundscape” and field recordings are a huge part of his work, for piece preparation or just for archival purposes, always recording, events, spaces or music. Multi-channel acusmatic music and radio pieces. Carlos presents himself solo in site-specific audio-video works, or in duos with João Silva (video, sound, photography), Ricardo Guerreiro (computer, mics), Emídio Buchinho (elec. guitar, mics, objects). He performed in several formations, as the [Des]Integração laptop ensemble (2001-2003) or in more electroacoustic sets, uses live-electronics and sampling which is the case of Suspensão septep, VGO, variable geometry orchestra and specially a trio close related to the “near silence” aesthetics, with Ernesto Rodrigues (violin, harp) and Guilherme Rodrigues (cello) with several CD releases, always with one international improviser as guest. He has presented his work in Portugal, Spain, France, UK and Germany. Worked with artists from several media: dance, performance and video, created music and sound design for video and animation, as well as video and sound editing for comercial projects. He is a co-founder and belongs to the Granular board of directors, a Portuguese association for experimental art, and does the image of Creative Sources label. He broadcasts Boca Doce, a show at Rádio Zero and other special shows. Workshops and seminars in digital audio manipulation, Max/MSP programming and sound art practices.